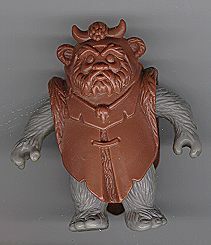 Unpainted Chief Chirpa First Shot: As it is essentially a fully-finished production figure, the above Chief Chirpa first shot from the unproduced second series of Ewoks figures , is a tantalizing taste of what might have been had the line made it just a little bit further. The figure is cast in its accurate color (not painted as with some less-developed forms of prototypes ), sonic-welded and has the copyright and date markings clearly visible on the back of one of its legs. It helps to give us some idea of just how close these things came to being released.